The W. Eugene Smith Fund is now accepting applications for its 39th annual Grant in Humanistic Photography. Since presenting its first grant in 1980, the Fund has awarded over one million dollars to photographers who have demonstrated an exemplary commitment to documenting the human condition in the spirit of Smith's concern and compassion. The Smith Fundwill present one recipient with a $35,000 grant. The Walk to Paradise Garden. 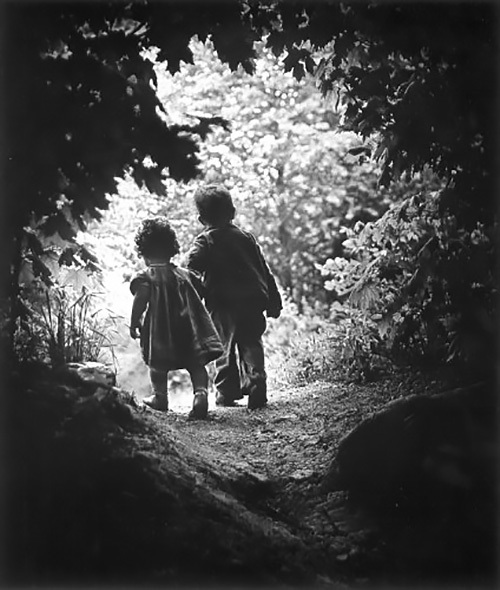 W. Eugene Smith, 1946. In addition, the Smith Fund is also now accepting entries for the 22nd annual Howard Chapnick Grant, which honors an individual for his or her leadership in any field ancillary to photojournalism. To submit an application for either grant or learning more about the grants and fellowship, visit SmithFund.org. The deadline for submitting applications to either grant is May 31. The Smith Fund is also announcing a new $4,000 award for students. Details about the new award will be released in the coming weeks. Grants, Fellowships and Awards will be presented at an annual ceremony at the School of Visual Arts Theater in New York City on Oct. 17. Attendance is free and open to the public. NEW YORK, N.Y. -- The W. Eugene Smith Fund announced it is now accepting applications for its 39th annual Grant in Humanistic Photography. Since presenting its first grant in 1980, the Fund has awarded over one million dollars to photographers who have demonstrated an exemplary commitment to documenting the human condition in the spirit of Smith's concern and compassion. The Smith Fund will present one recipient with a $35,000 grant; Fellowship awards will be dispersed at the discretion of the jury. In addition, the Smith Fund is now accepting entries for the 22nd annual Howard Chapnick Grant, which honors an individual for his or her leadership in any field ancillary to photojournalism. Photographers and other industry professionals interested in submitting applications for either of the grants (or interested in learning more about the grants and fellowship), should visit SmithFund.org. The deadline for submitting applications to either grant is May 31. The Smith Fund is also announcing a new $4,000 award for students. Additional details about the student award will be published in the coming weeks. The Smith Grant is given annually by The W. Eugene Smith Memorial Fund to photographers whose work is judged by a panel of experts to be the most impactful in highlighting an important humanistic story or issue, in keeping with the tradition of the great photo essays created by W. Eugene Smith during his 45-year career in photojournalism. The grant, which honors the legendary photo-essayist, enables recipients to undertake and complete their proposed photojournalistic and documentary projects. Past recipients have included Jane Evelyn Atwood, Sebastia[! ]o Salgado, Darcy Padilla, Lu Guang, Peter van Agtmael and Eli Reed. "We continue to be inspired and overwhelmed by the quality of work submitted by photographers all over the world in the name of humanistic photography," said Lauren Wendle, president of the Fund's Board of Trustees. "Last year's recipient, Daniel Castro Garcia, is a great example of the profound documentary stories being told in photographs and the significance the Smith Fund has established internationally." His project, Foreigner: I Peri N'Tera (a Sicilian colloquialism that translates as "feet on the ground"), is part of an ongoing study of the migrant/refugee crisis in Europe (focusing on Sicily, Italy) and captures the lives of those who survived the long journey across the Sahara Desert and Mediterranean Sea. Each year, the Board of Trustees appoints a three-member international jury that meets twice during the adjudication process. Finalists are selected based on the substantive, photographic and intellectual merits of their project. They are then asked to submit a comprehensive electronic portfolio and write, if necessary, a more detailed and focused proposal to answer questions by the jury regarding their project. Applications for the annual Howard Chapnick Grant are also open through May 31. The grant is presented to an individual for his or her leadership in any field ancillary to photojournalism, such as picture editing, research, education and management. This grant is not intended for photographers, but for champions of photography. It was established in 1996 to honor the memory of Howard Chapnick who led the Black Star photo agency and to acknowledge his enormous contribution to photography. The $5,000 grant may be used by the recipient to finance a range of qualified undertakings, which might include a program of further education, special research, a long-term sabbatical project or an internship to work with a noteworthy group or individual. This grant is not for the creation or production of photographs. The W. Eugene Smith Memorial Fund is supported by generous contributions from The Incite Project, Herb Ritts Foundation, Canon USA and The Phillip and Edith Leonian Foundation. Additional support is provided by Aperture, Brilliant Graphics, Center for Creative Photography, the International Center of Photography, MediaStorm, Photo District News, the School of Visual Arts BFA Photography, MFA Photography, Video and Related Media Department and Synergy Communications. "Awarding these grants each year is made possible through industry-wide support and by private donors," Lauren Wendle added. "It is imperative that we continue the funding, which allows these photographers to share their stories with the world. We invite anyone who is philanthropically minded and shares our interest in this special form of photography, to contact us. The W. Eugene Smith Memorial Fund is a not-for-profit corporation qualified under Section 501(c)(3) of the Internal Revenue Code. Contributions to the Smith Fund are tax-deductible."